Kreg's ACS (Adaptive Cutting System) Master Kit is your one-stop shop for crosscutting, ripping, mitering and beveling both sheet stock and solid wood. Versatile, portable and precise, it can make an ideal table saw substitute for small shops. 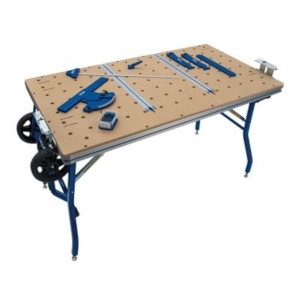 The system marries a high-performance track saw and a matching 62'' track with a sturdy, supportive table that can be folded up and rolled away when not in use. the Kreg Plunge Saw features a 62" Guide Track. The track guides the saw precisely on your cutline and protects against splintering to ensure that you get straight, smooth cuts. The Plunge Saw features a fully-shrouded blade, plus safety features like a retractable riving knife and anti-kickback protection that allow the powerful, variable-speed motor to cut safely while your hands stay well away from the blade. Parallel Guides and Rip Guides allow you to lock in repeatable measurements when using the track, so you can take precision cutting anywhere.